For an entire generation of Spider-Man readers, the late Gwen Stacy is mostly a legendary milestone in a winding road of backstory. To readers of a certain age, she may be a traumatic memory, but for many of us, she exists simply as a cautionary tale — that with great power does in fact come great responsibility. 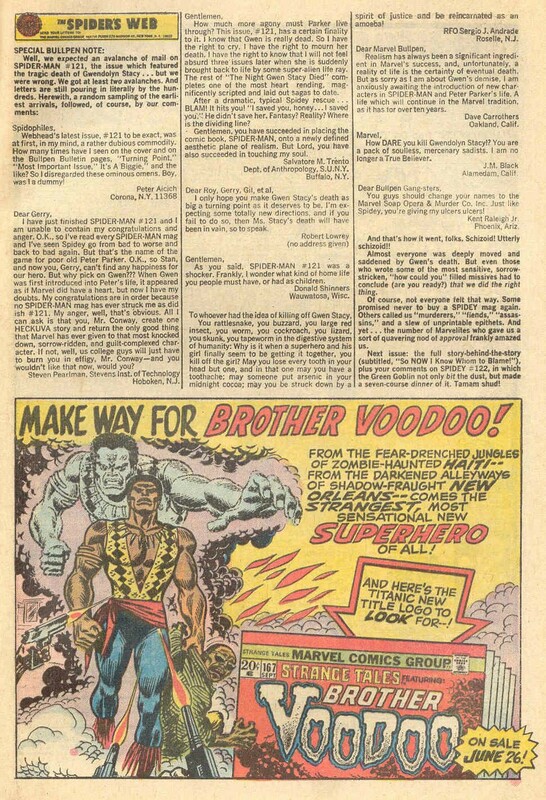 Her death, in the pages of Amazing Spider-Man #121, was momentous, and readers were as astounded as they were grieved. Within that pivotal issue, the Green Goblin casts Stacy over the George Washington Bridge. Spider-Man catches her with webbing, but finds that she’s already passed, whether from the Goblin or the whiplash of his own efforts. Outside of Uncle Ben-type origin stories, terrible things just didn’t happen to our heroes’ loved ones during that time. Stacy’s lesson was carved into Spider-Man lore as indelibly as comic book deaths can get, but over time she was whittled down to little more than a character-building moment for Spidey. And, that’s essentially how she remained — until recently. Actress Emma Stone’s perfectly charming performance as Stacy in the revamped Amazing Spider-Man films re-opened the wound and grated raw nerves anew. In this year’s sequel, her death was captured in a heart-rending scene for even the most seasoned Spider-Fans, but for the younger crop just entering the world of Peter Parker, it was a true shock. 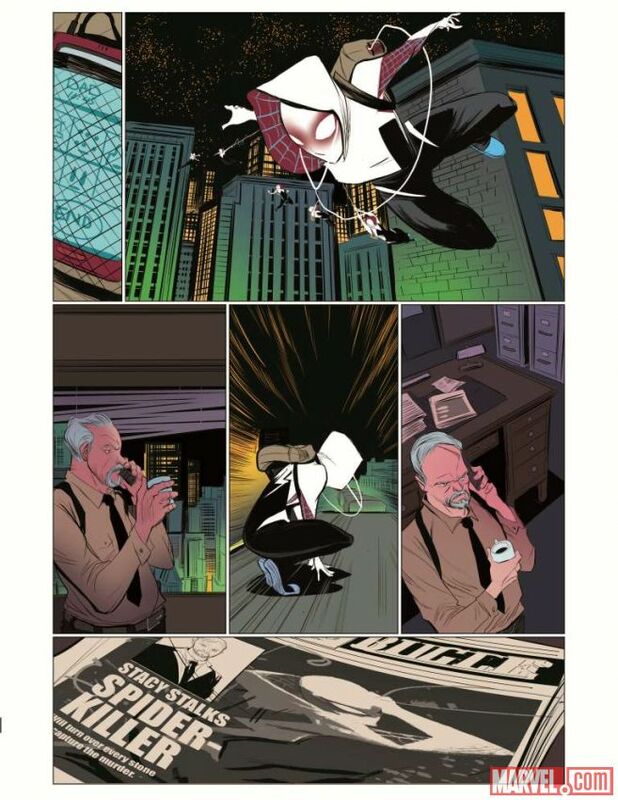 It may very well be those fans fueling the wave of acclaim surrounding the what-if style Edge of Spider-Verse #2, written by Jason Latour and penciled by Robbi Rodriguez. The issue imagines a world where Stacy was bitten by that fateful radioactive spider that turned Peter Parker into a parkour god and definitive superhero. 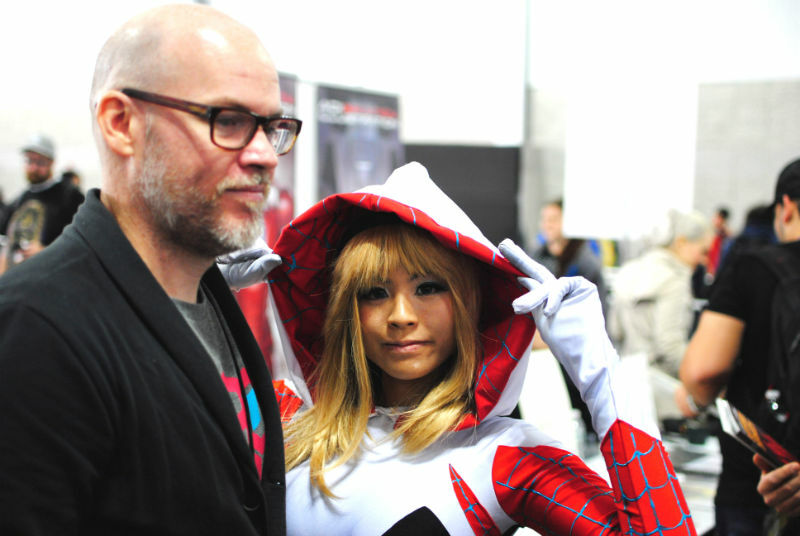 That wave crested last weekend at New York Comic Con when Marvel announced that “Spider-Gwen” would be getting her own ongoing series next year. For his part, Latour was initially unsure the idea would even work. “As a kid when I was reading Spider-Man, nobody knew who Gwen Stacy was. She was a plot point,” he said from his table in Artist Alley. “Maybe she wasn’t in those original books, for people that read them, but for me as a kid who picked it up 20 years later — to me she was just a plot point.” It was crucial, then, that she rise above a gimmick, even in a one-shot. The success took everyone by surprise. Penciller Robbi Rodriguez says he thought the one-shot would sell well initially before becoming “this lost little jewel you find in the dollar bin in a couple of years.” Rodriguez attributes the book’s popularity as much to the rise in female comic readers as the Emma Stone portrayal. His reimagined costume design isn’t hurting much either. “People just seem to love that costume,” he said, at his own Artist Alley table least weekend. “Even though it was my own laziness, because I knew I was going to draw this for like 20 pages, and I did not want to draw all that webbing over and over again.” The new hooded look merges elements of stark white with classic webbed accents. The book is vibrant and stylized, with stark, contrasting colors by Rico Renzi. The fundamental questions that linger at the end of the issue — how is she going to define herself? How is she going to define who Spider-Woman is? — will very much be the focus of the upcoming series. 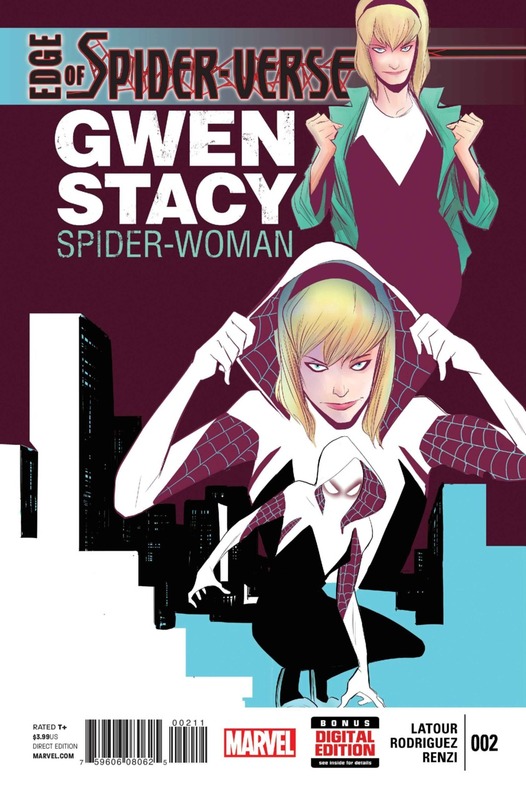 “One of the things I want to play with moving forward is, as Gwen tries to define who Spider-Woman is, what does that do to Gwen Stacy?” Latour said. In typical Spider-Man fashion, she will be balancing her family, studies and responsibilities as the drummer of The Mary Janes. (Even in an alternate world, Mary Jane is constantly disappointed).